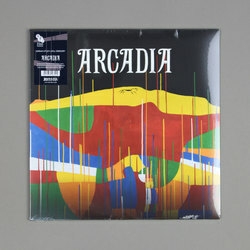 Adrian Utley & Will Gregory - Arcadia: Music From The Motion Picture. Vinyl LP, CD. Bleep. Few artists working in modern music are as well-equipped to make the move into film scoring as Adrian Utley and Will Gregory. Utley is part of Portishead and Gregory is a member of Goldfrapp, two groups who both have a penchant for the cinematic. It’s no surprise, then, that their score for Paul Wright’s Arcadia is such a success. There are moments here where the two neatly synthesise their existing styles. ‘Russell And Victor’, for instance, sounds like a collaboration between ... well, between Portishead and Goldfrapp. However, there are also moments where the pair makes off for pastures new. The 3-and-a-half minutes that comprise ‘Blood In The Soil’ see the track shift from punchy 140-bpm techno to the alien ambience and back again. Famed folk singer Anne Briggs guests on two songs.